October 22, 2014 By Joe | Heads up: Buying via our links may result in us getting a commission. Here's why. What are you going to wear? Sometimes it’s good to look at a few suggestions then add your own tweaks and ideas. That’s what these are for. There’s a huge segment of the population who defaults to sweats or rags when they’re at home. No issue there. It’s your place, you wear what you want. But if you’re the type that doesn’t feel quite right laying around in pajamas all day (memories of strep-throat stricken days at home from school), here’s one suggestion on how to stay comfortable but still look, y’know, not infected… on a damp & dreary & totally awesome day away from work. Say, if you’ve taken the day off to use a “sick day”, since you never actually get sick. The Sweater: GAP Lambswool Blend Turtleneck – $69.50. Or, whatever favorite down-time sweater you’ve got. Whether it’s a shawl cardigan, a favorite crew… whatever. These are the days to channel your inner seafaring fella. That GAP turtleneck goes on sale quite often (as does all GAP stuff) and it looks much better in person. The Watch: Seiko SNZG15 Automatic – $146.44 . Inexpensive, durable, automatic, and a nicely sized casual diameter of 42mm. 100m water resistance, so you don’t need to be scared about wearing it out in the rain. Nylon strap = functional without having to worry about taking care of leather, plus, it also means you don’t have to concern yourself with matching it to your belt. The Belt: Fossil Beckett Reversible Belt – $40. You don’t usually see a roller-buckle style reversible belt. Not bad looking at all. Plus, there doesn’t appear to be any visible “Fossil” branding. The Pants: J. Crew Factory Straight Fit Garment Dyed Jean – $37.12 w/ EXTRA25. More saturated than a standard pair of denim (favorite pair of jeans obviously works here too), but still plenty comfortable in a straight but not billowing fit. Another 25% comes off the sale price with the just launched EXTRA25 code. The Boots: Chippewa 1901M25 6-in Service Boot Cordovan – $207.20 w/ BOOTUP14 ($259). All the looks of a J. Crew collaboration, without all that markup. An extra 20% off through Amazon with the code. No, not cordovan leather, but cordovan in shade. Made in the USA. Classic. Terrific. The Socks: Wigwam Merino Crew – $10 – $15 . Crazy durable, comfortable, and washable. Also great for running in when the temps start to dip. The Entertainment: 20,000 Leagues Under the Sea | PBS / BBC’s Inspector Lewis. 20,000 Leagues isn’t a kids tale. Sure, there are versions that have been chopped up, shortened, and disney-tized. But if you try to find a version that stays as close (as possible) to the original translation, it reads extremely well for a rainy afternoon. Meanwhile, Inspector Lewis is a hugely popular BBC detective series, and for good reason. Kinda like Law & Order minus the melodrama and music cues, the chemistry between the actors is terrific. And the way they coolly work their way through the case is free from hysteria. Clothes are good too. Streams free on Prime if you’ve got it . The Drink: Balvenie 14 Year Caribbean Cask Single Malt Whisky – $64.99. Worth saving up for. A Speyside (not peat-y) that’s been finished in Rum casks. You’ll want to sip and savor, but it won’t fight you back. The cherry on top of this pretentious sundae: “The Den” Candle by Bespoke Post – $10. What… a dude can’t put on a turtleneck, sip some Scotch, light an awesome smelling yet not overpowering candle, and read a classic Science Fiction novel on a rainy day off? No? Oh. I’m still pretty peeved those jeans were $24 less than two days ago. I need to pull the trigger on them but I’m still waiting for a better deal to come around. That Balvenie is definitely a staple of my relatively modest liquor cabinet. Their 12 year is also really good for the price ($40ish usually). Gotta take a WFH day tomorrow to get a new alternator put in my car and will be taking a few styling cues from this (comfy sweater, rain-friendly boots). Don’t anybody tell my boss that I’ll be sipping on a couple fingers of Lagavulin 16 as soon as the clock tips noon. fyi, the copyright on 20,000 Leagues is expired, so you can get it free on Project Gutenberg (Kindle also has a free classics section that you don’t need to be a prime or unlimited member for). Gutenberg has it in a couple languages (if you want to be extra worldly and read it in its original form: Vingt mille lieues sous les mers) as well as a bunch of other Verne novels. Can’t recommend Gutenberg enough. As for Amazon, you can get a lot of Verne for free, and you can also get just about all of Conan Doyle as well. Just pulled the trigger on those boots. I’ve been eyeballing that exact pair for a few weeks. I’m also a huge fan of quality wool socks. I’ve been very happy with the Merino Wool Kirkland Outdoor Trail Socks. They’re basically all I wear on the weekends. Bear in mind also that Chipp makes the Katahdin boots for LL Bean. You can get a slightly different set of styling cues from Bean and I believe they’re available in EE where the Chippewa branded boots aren’t. In the market for a new pair of boots, but not sure how those Chipps would hold up in the Northeast winter (in other words, wouldn’t want to ruin that nice leather in the snow)…anyone care to opine? Much appreciated. Sweet…I am calling out sick. LOL. Couldn’t agree more on the Balvenie Carribean cask! It’s also a great scotch for someone just getting started with scotch (watch out for that slippery slope)! So smooth, since it’s not so peat-y or smokey and has that sweet finish because of the rum cask aging. The Seiko SNK807 is $55-67 also on Amazon, and it’s a bit smaller for slender wrists/fans of smaller watches. Wish I could rake a rainy mental health day… or a sunny mental health day for that matter. If you guys ever hit a duty free shop on your way home from somewhere, try and pick up the Balvenie 14 Golden Cask. This bottle is everything the Caribbean Cask is but better. I think they’d do just fine. You’d want to waterproof them, but you’d do that with any leather boot. The sole might be a little slipperier than something like the Red Wing Beckman, but not to the point where it’d be a concern. They aren’t super warm in and of themselves, so make sure it’s big enough you can fit a thick sock in there. I’ll be in boxer briefs, so you’re more dressed up than one person. Heh. Yep, and acknowledged in the italics. I myself love to get a run in, early, especially if it’s raining. So to come back cold and soaked, then clean up and put on something decent, that to me is awesome. All depends on what ya find most relaxing though. Good point. I worked from home frequently on my most recent client engagement, and noticed that there was a significant difference in my productivity if I dressed for the office while still at home. Granted, “dressed for the office” for this client meant a pair of nice khakis and a button down and/or sweater. Very business casual. This post kicked my behind into gear to put on real clothes today, so thank you for that. Excellent point! I’ve almost pulled the trigger several times on those very Bean boots over the years but just haven’t. I wish I had earlier because they’ve crept up in price a bit. Big fan of the Doublewood myself. This is my first pair of high quality leather boots. Can someone point me in the right direction in terms of how to waterproof and care for them? Also what kind of abuse can these take and still look good? I like the way they look now, will they continue to look this good if I wear them for weekend yard work and winter tasks? I’ve had mine in the original brown for several years and quite like them; I prefer the speed hooks the Bean branded ones come with as well. I love watches and that’s a great Seiko, but if you really want to roll off-clock, what are you doing checking the time? That’s your guilt about playing hooky getting the best of you. I think the more abuse they take, the better they’ll look. I use SnoSeal on my leather hunting boots. And don’t dry them by a fire or heater. If you want them to look mint forever, you’re going to be sad panda if you ever do any work in them. With ya there, Joe. Early run on my WFH days also allows me to enjoy a wee tipple with lunch because exercise is done for the day. 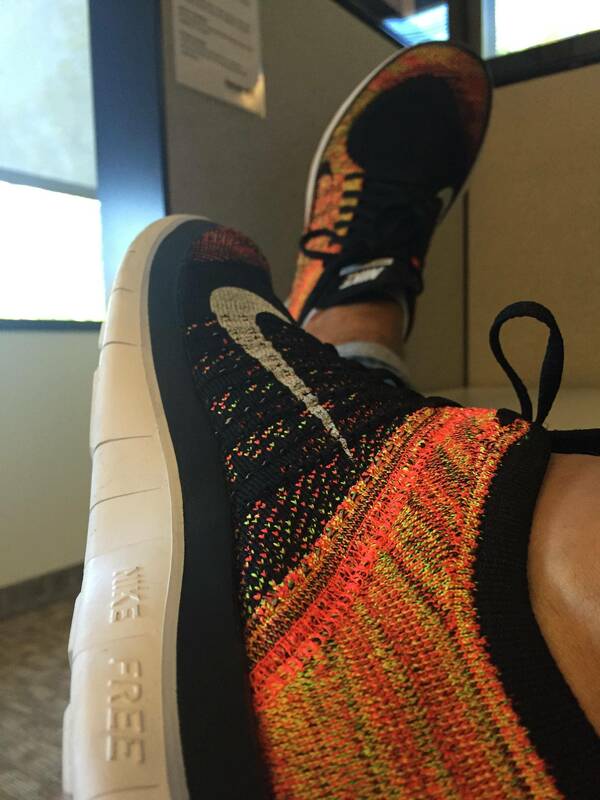 Since we’re on the topic, worth mentioning my Nike Flyknit 4.0’s. Really sharp free runs that have been treating me well on the pavement, and with skinny jeans on Fridays in the office. This stuff is good, but in my opinion the colder weather calls from something with a bit more of a bite. Nothing better than sitting out by the fire on a brisk night with a glass of peaty Scotch or Rye Whiskey. This post makes me long for the Orvis Fisherman’s sweater I bought for $40 at the end of last winter. I never got to wear it and I am jonesing to pull it out. The other nice thing about the Bean’s variant is no-hassle returns, for life. On the downside, there’s a Bean’s store near me, so sales tax. Boo. Thanks for the heads up on the boots! Bought those exact Chipps last week at full price, just talked to Amazon CS and got the 20% refunded. Wisconsin’s shoe game is so strong. Chippewa, Allen Edmonds, Thorogood and I’m sure others. I love my RW IRs but wish I had supported the home state and went with some Chippewas like these here. Definitely will be my next pair… as soon as I can justify spending another $250+ on boots. I’ve had a pair of those for several years now. They’re great looking boots, very durable. They’re cap toe but that “oiled leather” is a nubuck finish which makes cleaning and maintenance a little more difficult since you can’t just use saddle soap on them. They’ll take plenty of abuse but my full grain leather boots get cleaned with saddle soap once a year and then get a Nikwax treatment (I use the liquid for full grain leather not the wax). That stuff is great – it waterproofs leather well and is non toxic to humans and the environment. Can be found at your local outdoor outfitter. They also make a special cleaner and waterproofer for suede and nubuck that works well. Don’t know why Thorogoods don’t get more play here. Their union-made-in-Wisconsin moc toes are, at least looks-wise, virtually identical to Redwing moc toes. And, they’re really comfortable and durable – maybe not quite as durable as the Redwings but in the same general neighborhood. Given that at full price the Thorogoods are still cheaper than Redwings at a steep discount, you’d think they’d get a rec once in a while.